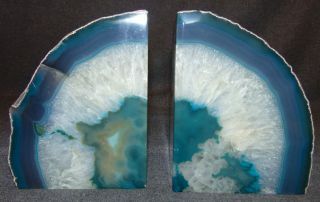 Pair (2) of Large Brazilian Blue Green Polished Agate Bookends. Each stands 6-1/4" tall. Condition is Mint. No Damage. Serious inquires Please contact us. Click on Picture to see additional photos.